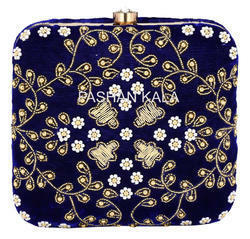 We are manufacturers and exporters of Beaded Clutch Ladies Embroidery Purse. We have huge collection to offer in this catageory. We can customized according to buyers requirements. We are offering Clutch Purse for Women Evening Party to our clients. Our range of Designer Hand Purse is widely appreciated by our clients which are situated all round the nation. We offer our range of Designer Hand Bag at most affordable prices. 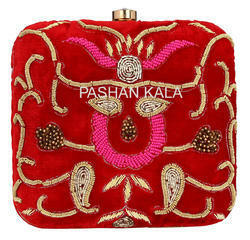 We are manufacturer and exporter of high designed Beaded and Embroidery Festive Party Clutch Purses. We have many styles of fashion hand bags as well to offer. We can develop any style according to buyers requirements. We are manufacturers and exporters of Beaded Decorative Clutch Purse for Wedding Party. We have many colors and styles in this catageory also. We can make according to buyers requirements also. 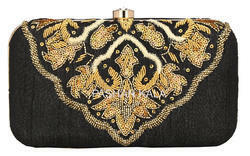 We are manufacturer and exporter of Hand Embroidery Beaded Clutch Purse for Women Party. We have a huge range to offer in this category. We can even work on buyers inspiration. 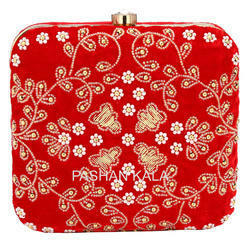 We are manufacturers and exporters of Zari Embroidered Clutch Purse. We have many styles and design to offer in this catageory. We can make according to buyers requirements. We expertise in hand embroidery and can handel any order quantity. 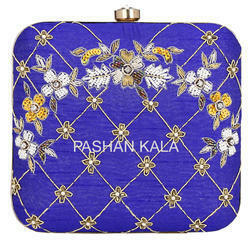 We are manufacturers and exporters of Beaded Zari Embroidery Clutch Purse and Box. We have many colors and styles in this catageory also. We can make according to buyers requirements also. We are manufacturers and exporters of Ladies Party Beautiful Beaded Clutch Purses. We have many styles and designs to offer in this catageory and we can also make customized Hand Bags also as per requirements. Under the guidance of our expertise, we offer a wide range of Beaded Zari Hand Embroidery Clutch Purse. These are available in variety of shapes, sizes, designs and patterns as per the needs and requirements of our respected clients. Our range of product is well acknowledged for its superior quality, accurate dimensions, cost effectiveness and durability. 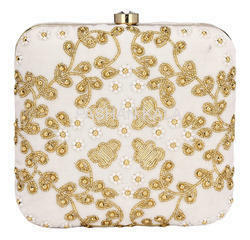 We are indulged in offering Zari Embroidery and Beaded Evening Party Clutch Purse to our clients. These bags are designed by our experienced designers and then made using soft Fabric. Our zari Hand Bags are elegant in looks, neatly stitched, wear and tear resistant and reflects the creativity of our designers and craftsmen. 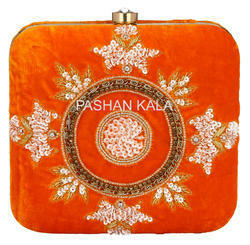 We are indulged in offering Zari Embroidery Casual Party Beaded Clutch Box to our clients. These bags are designed by our experienced designers and then made using soft Fabric. Our Beaded Clutch Purse are elegant in looks, neatly stitched, wear and tear resistant and reflects the creativity of our designers and craftsmen. We are indulged in offering Handmade Beaded Clutch Purses to our clients. These bags are designed by our experienced designers and then made using soft Fabric. Our Embroidery Purse are elegant in looks, neatly stitched, wear and tear resistant and reflects the creativity of our designers and craftsmen. 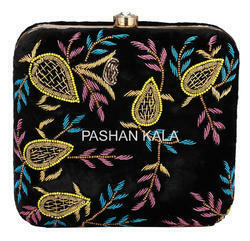 We are manufacturers and exporters of Beautiful Black Febric Zari Hand Embroidery Clutch Purses. We have huge range in this catageory to offer. We can make customized also as per requirements. We are manufacturers and exporters of Black Fabric Zari Hand Embroidery Ladies Clutch Purse. We have huge range in this catageory to offer. We can make customized also as per requirements. Looking for Ladies Embroidery Clutch Purse and Bags ?